This entry was posted in Uncategorized and tagged Hatton Road, Hiking, hong kong, The Peak, Trail, travel, Victoria Peak, Walking by christao408. Bookmark the permalink. I love to leave the city for nature. We have some beautiful trails here. That waterfall is lovely. @agmhkg – Oh, that one is famous and shaped like a woman holding a child? I’m going to be in HK next month (decided to do 1 week only so thailand will have be wait, again)! Might have to add hiking to my itinerary if weather permits. 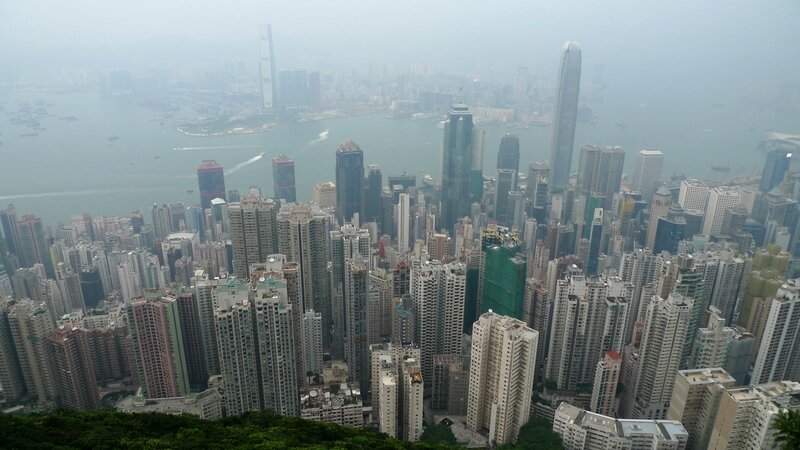 I remember being on Victoria Peak and looking at Hong Kong. Even at that time, there was an urban concret jungle. We had taken the small train up, and the view all along the track was beautiful. Nice photos. I haven’t been Hong Kong for 10 yrs. @murisopsis – It really does look like your orb, doesn’t it? You should mass-produce those. I bet you could sell a great many! @agmhkg – Dunno about HKG but we’ve been having lovely weather here in BKK. Breezy all day long and only about 28-29 C. If this continues for the next three or four months, I’ll consider it a great winter. @Fatcat723 – One thing that amazed me is how well-aware locals are of the extensive trail system. Kudos to the HK government for developing and advertising the network. @CurryPuffy – Isn’t there also a lion-shaped rock up above Kowloon City? Used to be near my home on La Salle Road in Kowloon Tong, although I don’t know if you can hike up there. @waiszeblogs – Even if you just do the flat loop around the Peak, which isn’t very tiring, it would be a fun break. Enjoy your trip and we’ll see you in Bangkok next time! @xx__lamlam__xx – Hong Kong really is a very accessible city and that’s something I miss about living there, too. In fact, that’s something I miss anytime I’m in another city in the world where transport isn’t nearly so convenient. @ZSA_MD – There are those who say Hong Kong is developed enough and yet it keeps growing. @foggysunnymorning – 10 years? Time for a return, I think! Ha ha! @christao408 – Lion Rock that’s it! Have not hiked up there, but I heard you can do rock climbing though! 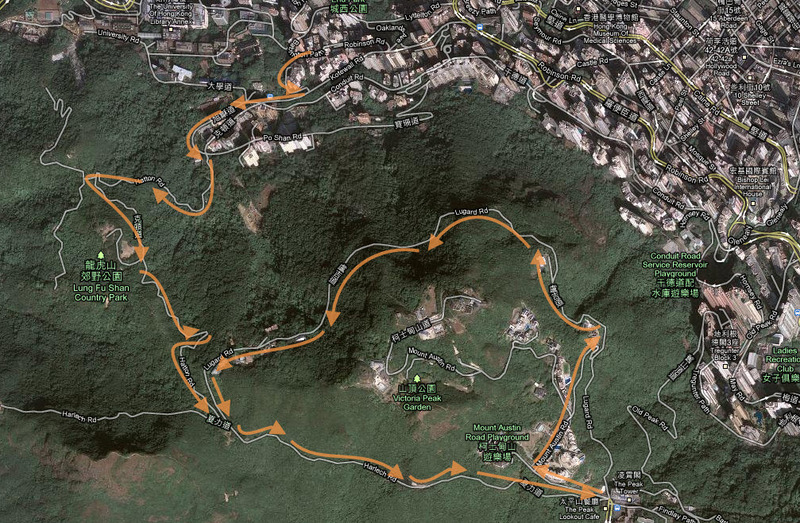 Woohoo…only eight more weeks for me to go and I’ll be doing some hiking in HK! Never tried hiking in Hongkong. It must be a wonderful experience enjoying the view and nice cool weather. you have map of the route kind, many people just forget it. that looks like a great hike! i haven’t been hiking in a long time… i kind of miss it. then again, i’m going to get in a very long run on sunday and the scenery will be nice (both the trees with their colorful fall leaves and the eye candy amidst the 30,000 other runners), so i suppose that sort of makes up for it. I love when cities have a nice nature-y place to escape to close by. It’s nice to be able to get away from all the concrete every once in awhile. I have gone hiking in this area too. I used to walk down a hiking path from the Peak to the Pok Fu Lam reservoir where you can see a beautiful view of the reservoir. You can also take the No. 13 bus from Central (City Hall) to the bus terminus at Kotewall Road and walk along a hiking path upward till you reach the Peak. 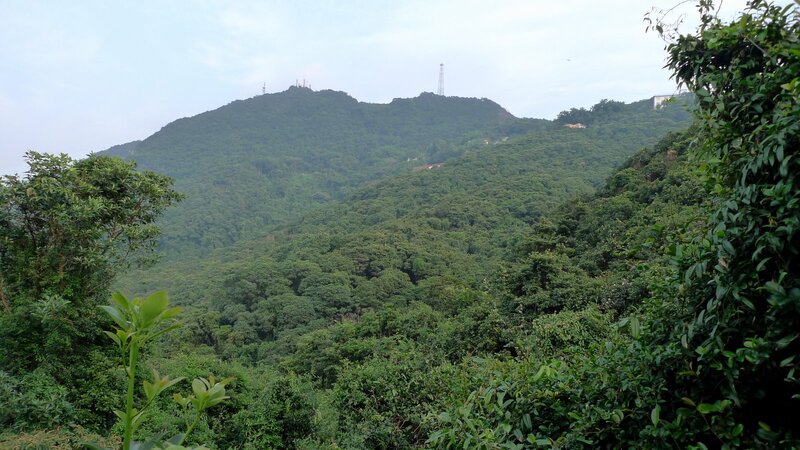 I like going hiking in Hong Kong Island, Kowloon, and in the New Territories. @christao408 – i’m particularly looking forward to seeing the marines who will be running in running shorts and singlets hahaha. @christao408 – No worries, Chris. I’m very tempted too in making a side trip to BKK, but I have to see if I can leave my parents alone for a few days. BKK is only a couple of flight hours away! @christao408 – hahaha very clever! Good one, Chris! I’m with everyone else who said it is a wonderful thing when a city has easy access to nature. Keeps a lot of us from going insane. @Wangium – When you’re in the midst of the urban jungle it is easy to forget that there is a real one out there, too! @RakkaRay – Amen to that, Ray! 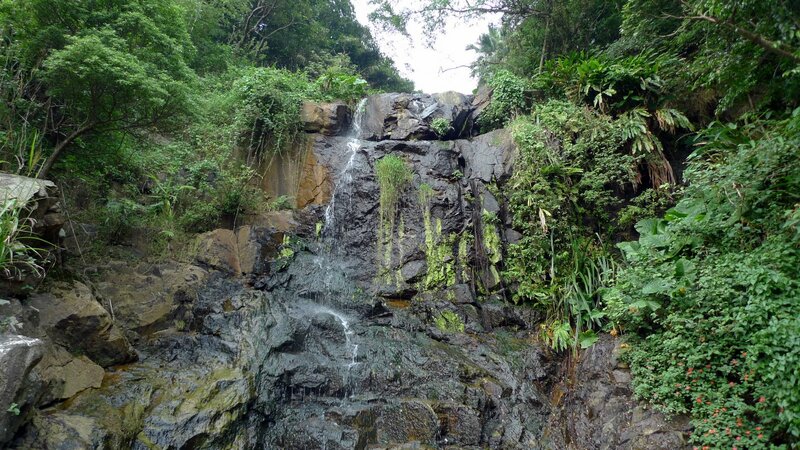 Lantau Island is pretty interesting too (from a hiking perspective). @ElusiveWords – You would see that side of him if you ran behind him in a race. @ElusiveWords – When I moved to Hong Kong, my first weekend there my ex-boyfriend (who had moved back to HKG from the US) took me hiking on Lantau with a group of his friends. We camped overnight at a youth hostel near the Po Lin Monastery then woke up at 4 am or some ungodly hour and hoked to the top of Lantau Peak to watch the sun rise. The mountaintop was crowded with other young people who had hiked or camped up there and when they sun crept over the horizon they started yelling and screaming. What I had been expecting would be a peaceful, serene, almost religious moment was instead a raucous party. @christao408 – Hey, you are not a tourist then lol Hope you had a great time here. @MichellelyNg – I always enjoy returning to Hong Kong and look forward to the next visit.